ALBANIA OPEN WATER SWIMMING - A.O.W.S. 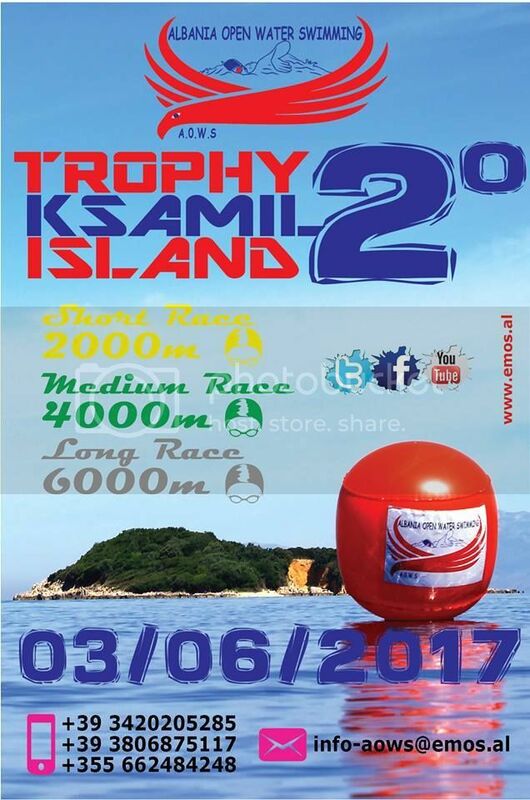 is pleased to present and to organize the 2° TROPHY KSAMIL ISLAND involving all swimmers and amateur athletes who practice this sport because they love the challenge themselves, and savor the feeling of being free swimming in the sea . Ksamil is a common in southern Albania in the District of Saranda which will host the event. The beaches of Ksamil are small but beautiful wet from a crystal clear sea. The race course includes the departure from a beach of Ksamil until they reach the two islands that are located across the bay, until they return to the beach to start. The two islands are called by the locals "Twin Islands" because they are joined together by a tongue of land, and the particularity of the race course will be to get to the two islands, rising out of the water on the small beach that emerges between the sea waves meet, and then dive again and swim towards the finish.